Tailored to the choices of its compiler, the scrapbook is an exemplar of graphic authorship. 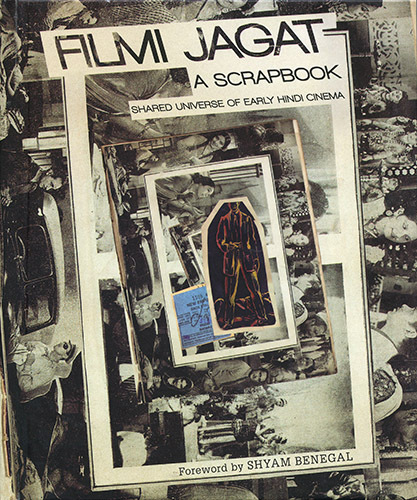 As one of the most understudied models of personal expression and public encounter in the Indian context, this publication presents the pluralistic compositions and complex if not raw visual samplings of FilmiJagat: A Scrapbook (the Cinema Universe) reproduced as plates in entirety following three exploratory texts. The richly illustrated lead essays by KaushikBhaumik and Debashree Mukherjee, probe conceptual and biographical strains emanating from the object, repeatedly stamped on several pages by the alleged owner/creator, Mangaldas V. Lohana. Its composite structure includes clippings from film magazines, song booklets, and advertisements produced between the 1930s -1940s. Therein emerges a personalised and fragmented history of early Hindi film from the pre-Independence period, featuring snippets of lost movies such as ApniNagariya, KunwaraBaap, DuniyaKyaHai, and Tasveer. Currently in the growing collection of Rahaab Allana, his own essay features 19th century examples as well as film stills and lobby cards from the 50s-80s, briefly examining the evolving dynamics of visual autobiography. Hence, as an ensemble, this edited volume attempts a sensory connection with photography and print history through personal ephemera, further emphasising its cultural value in a digital era.